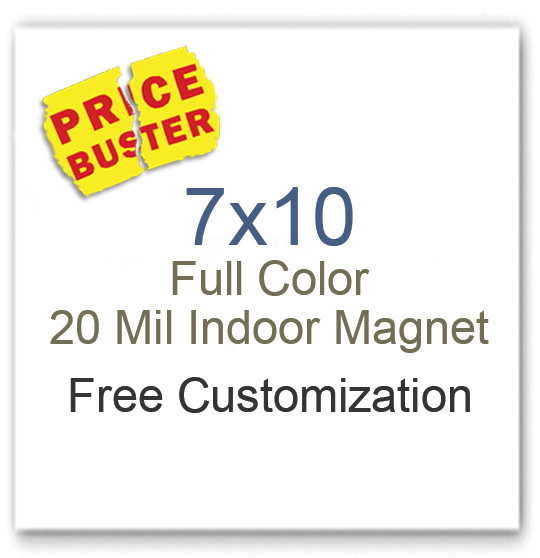 Have you ever thought in the first place, why the blog is titled popular 7 x10 magnets that everyone uses for branding? Because it is one of the popular sizes of personalized magnets used for value building by businesses and individuals alike. 7×10 bumper sticker magnets are going to expose you to a new crop of customers with their largesse attitude. They may not be as influential as a billboard or a big banner announcing new products, discounts, or change of address, but they would certainly stir a talk within prospects. Marketers can urge their customers or friends to carry full color 7×10 customized outdoor magnets over their cars. Many marketers are nowadays employing this technique to find loyal customers and they are rewarding customers doing so. For eg – Many pizza marketers in US are gifting away outdoor safe magnets printed with their contact information and urging their customers to carry them. Car owners carrying customized bumper stickers are identified and honored by these pizzerias during different occasions. Sales flyers are popular and people enjoy reading them. Going by the recent trends, people expect sales flyers to educate them about the brand or business. No wonder, marketers have started creating sales flyers over shaped objects or custom shaped magnets or 7×10 magnets. They know the later offers them large room for positioning their information. Perfect for tradeshow and business gifting. Gone are the days, when people expected you to hand them glossy three fold promotional brochures. Today, with increasing work pressures, no one have time to glance through 3 paged or folded brochures. They expect to grab short and informative brochures and you can easily create impressive brochures over these personalized magnets 7 x10. People would be happier to retain them over their refrigerator doors as long as they want. Be it a pizza delivery service, newspaper delivery, candy store or any other big and small business, they do send out promotional mailers for influencing their customers. They can now make a difference to their campaign by indulging promotional mailer magnets 10×7. They can use it for printing their business information, sharing special business messages, printing individual information and more. Large rectangle magnets as the one mentioned above make great items for printing menu cards. Restaurants, pizzerias, hotels, beach accommodations, and ice cream parlors are some beneficiaries of this trend. They can print it with information about their specials followed by contact details and bright full color logos. Customized menu cards/special cards are perfect for gifting during niche tradeshows, in-store promotions, festive gifting and along with deliveries. Customized discount cards/coupon cards can influence anyone because of the important money saving information they carry. Recipients would proudly flaunt it over their refrigerator doors or other visible surfaces within the home and discuss it with their family, friends, and colleagues. By now many newbie and established marketers have realized that investing in calendar magnets is one of the smartest things they can ever do. Very much alike paper calendars or desktop calendars, people would stick these full color magnetic calendars at easy-to-find locations. Calendar magnets 10x 7 are perfect for tradeshow gifting or they are also great for sending business mailers. Apart from the above mentioned, marketers can seek these large customized magnets 7×10 for designing sports schedule magnets, holiday wishes magnets and many more.